Whitstable, Kent, U.K. – A new BULK-OUT® Bulk Bag Weigh Batch Unloading System with Manual Dumping Station and Flexible Screw Conveyor automatically conveys weighed batches of contamination-sensitive materials to downstream processes and allows rapid sanitising. The BFC model discharger frame is equipped with a cantilevered I-beam with electric hoist and trolley for positioning of bulk bags without the use of a forklift. A SPOUT-LOCK™ clamp ring atop a TELE-TUBE™ telescoping tube securely connects the clean side of the bag spout to the clean side of the equipment intake, and maintains constant downward tension on the bag as it empties and elongates, promoting complete discharge from the bag. At timed intervals, FLOW-FLEXER™ bag activators increasingly raise opposite bottom edges of the bag as it lightens, ultimately forming a steep V-shape that promotes complete discharge of free- and non-free-flowing materials from the bag. A bag dump station with folding bag shelf allows manual dumping of minor additions into the hopper from hand-held packaging and containers. 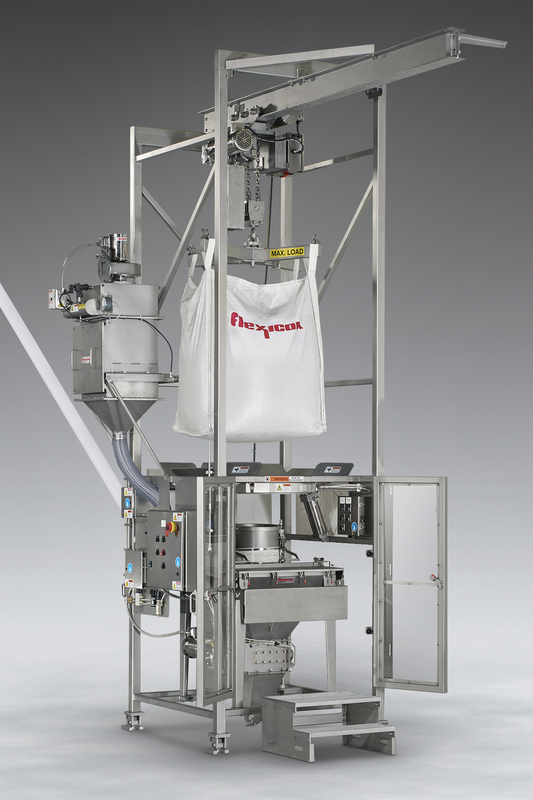 BULK-OUT® Sanitary Bulk Bag Weigh Batch Unloading System with integral flexible screw conveyor and BAG-VAC™ dust collector shown with safety interlocked doors in open position and manual dumping station bag tray in lowered position. The hopper is vented to a BAG-VAC™ dust collection system that draws airborne dust from manual dumping activities away from the operator when the hopper lid is open. When the hopper lid is closed during bulk bag discharging, the dust collection system additionally prevents displaced air and dust from entering the plant atmosphere, and collapses empty bags prior to tie-off, preventing dust generated when empty bags are flattened manually. A FLEXI-FORCE® lump breaker integral to the hopper reduces agglomerates and promotes the continuous flow of material into the charging adapter of the flexible screw conveyor. Load cells supporting the entire system are linked to a PLC that stops the flexible screw conveyor once the system has lost a pre-set amount of weight. The flexible screw is the only moving part contacting material, and is driven above the point at which material exits the conveyor, preventing material contact with seals and allowing rapid sanitising in place. The screw can also be removed through the bottom of the tube for sanitising and inspection. Positioned above the clamp ring is a POWER-CINCHER™ pneumatically-actuated flow control valve that cinches the spout concentrically, allowing re-cinching of partially empty bags for leak-free tie-offs. The entire system is constructed of stainless steel finished to sanitary standards, and is rated for wash down. Flexicon also manufactures tubular cable conveyors, pneumatic conveying systems, bulk bag conditioners, bulk bag fillers, bag dump stations, drum/box/container tippers, weigh batching and blending systems, and automated plant-wide systems for handling of bulk food, dairy, pharmaceutical, chemical and mineral products. Flexicon (Europe) is a "bulk-online Leader"
HammerTek is a "bulk-online Leader"